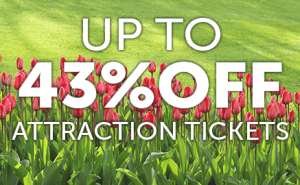 The UK is our home turf and we’re proud to offer you a wide selection of discounted attractions all around the country. From the dazzling sights of London to historic Stratford-upon-Avon, tranquil countryside and fun visits to working farms, there is so much to see and do that choosing what to do first will be the hardest part! Have a look at our offers below, get out there and start exploring!